Schaumburg, Ill. – Graphco has recently been appointed an expanded territory for Standard Horizon Finishing Equipment in Illinois, Missouri and Kansas. Graphco has a long history with Standard and Horizon in Ohio, Kentucky, Western Pennsylvania and Indiana, dating to 1983, and has consistently been one of Standard's strong service and sales dealerships. Within a few weeks of this change, a completely automated Horizon BQ-470 & HT-80 perfect binding line was purchased by Independent Publishers Group. 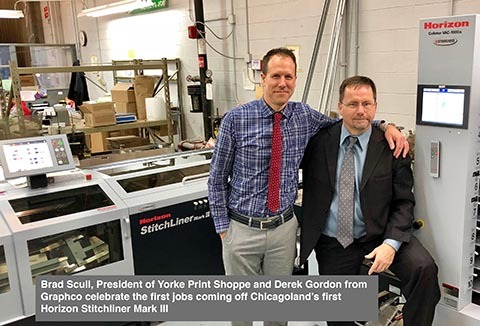 This system was followed up by a number of CRF-362 crease & fold units, a SmartSlitter, an RD-4055 rotary die cutter and most recently Yorke Print Shoppe purchased the first StitchLiner Mark III Saddlestitcher, in the Chicago marketplace. “We felt it was important to hit the ground running, and to be honest offering the best finishing equipment on the market to all of our well-established customers has been truly gratifying. I appreciate the confidence these folks have shown, and with Standard Horizon I know we will exceed their expectations,” comments Derek Gordon, Graphco’s Midwest Regional Manager. Graphco is headquartered in Cleveland, Ohio, and opened their Schaumburg, Illinois branch office in 2014 to better reach customers in the Midwest, with primary focus on the popular RMGT offset presses. Derek Gordon is available for Standard Horizon finishing equipment sales consultations immediately. Technical service requirements will be handled from the Schaumburg office with the appointment of a 20+ year veteran Factory Trained Standard Horizon Technical Service Representative and the recent addition of another 25+ year industry veteran Technical Service Representative. Graphco also employs 5 additional Standard Horizon Factory Trained Technicians, so they are well positioned to protect new and existing Horizon investments in Illinois, Missouri, Kansas, Ohio, Indiana, Kentucky and Western Pennsylvania. “The Standard relationship is our longest term dealership and it’s a huge honor to now offer Standard Horizon Finishing Equipment throughout much of the Midwest. Standard Horizon has always been the class of the industry and we look forward to future success in this region starting immediately,” states Chris Manley, President of Graphco. Founded in 1976, Graphco recently celebrated 42 years of service in the print industry, marked by the grand opening of its WD Manley Technology Center and a renewed commitment to helping their customers succeed. Graphco is eager to extend their reach into the central Midwest and provide the highest quality Standard Horizon Finishing solutions and superior technical service to this new market.